Sola Scriptura OR Solo Scriptura? You are here: Home / Sola Scriptura OR Solo Scriptura? In a recent post, I suggested that nobody believes in Sola Scriptura. In a comment, Tim Nichols from Full Contact Christianity challenged my definition of Sola Scriptura, as not being the same definition that was used by the classical Reformers when they talked about Sola Scriptura. I was intrigued, and so asked where I could read more about what he was saying. 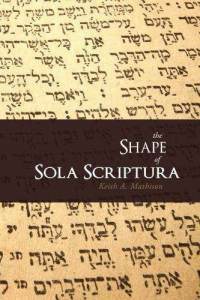 He recommended a book by Keith Mathison called The Shape of Sola Scriptura . So I obtained the book and read it last week. It turns out Tim was right. And so was I. Let me rephrase that. I stated that Reformers like Luther, Calvin, and Zwingli “tried to reject tradition and return to the Sola Scriptura,’the Bible alone. '” This was the statement Tim Nichols objected to, and after reading the book by Mathison, I stand corrected. Mathison argues fairly persuasively that when most people today talk about Sola Scriptura, what they really have in mind is Solo Scriptura. “Solo” Scriptura is the idea that we can learn all matters about faith and practice using the Bible alone, plus nothing else. If a group or person studies the Bible, and they think they have found some truth, doctrine, or practice in Scripture, then they should believe or practice this idea, whether or not it was ever believed or practiced previously in the history of the church. This is “Solo” Scriptura. Sola Scriptura, on the other hand, as talked about by the Reformers, held to nothing of the sort. 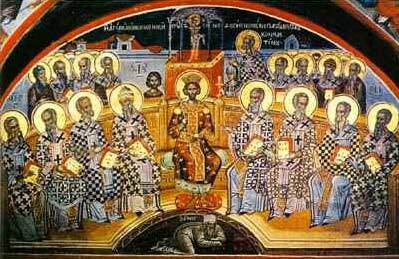 They believed that Scripture should be studied in conjunction with the rest of the community of the Saints, especially those Early Church Fathers who helped develop the Creeds of Nicaea and Chalcedon. The Scripture is to be interpreted by the Church within the hermeneutical context of the regula fidei or rule of faith. The rule of faith has found written expression in the ecumenical creeds of the Church. The Nicene Creed and the definition of Chalcedon are the creedal confessions of all orthodox Christians and serve as the doctrinal boundaries of orthodox Christianity (p. 337). And it is here, I think, that Mathison’s book failed to provide an adequate answer. In general, he suggested the creeds of Nicaea and Chalcedon. Frankly, I am a little skeptical of some of the elements in these creeds since they were developed after Christianity became the official state religion of the Roman Empire, and I fear that some of the statements of these creeds were politically motivated, and were heavily influenced by Roman Emperors, rather than by honestly dealing with the text of Scripture. Nevertheless, I do believe almost everything in these two statements, except for one minor little statement near the end of the Nicene Creed (“We acknowledge one baptism for the forgiveness of sins”). But beyond that, Mathison, who is a Reformed Calvinist, hints at various places that he also thinks that we should include the traditional decrees of the Four Councils of the Church, the Second Helvetic Confession (p. 137), and the Westminster Confession (p. 138). I am definitely not ready to accept these Creeds as hermeneutical boundaries for the interpretation and application of Scripture. Mathison might say that by such a refusal, I am placing myself as an individual above and against the Holy Spirit-guided consensus of the rest of the church, which therefore places me in the category of “heretic.” But I, and millions of others, just cannot agree with some of the ideas and statements in some of these creeds. I think Mathison recognizes this, which is why he usually only mentions the Nicene Creed and the Definition of Chalcedon. However, accepting these two statements does not come close to solving the problems that Mathison has raised on his book. For example, he talks about the heresies of “justification by faith alone” (p. 237), annihilationism, hyper-preterism (p. 242), Openness of God, and Religious Inclusivism (p. 281). But the Nicene Creed and the Definition of Chalcedon say nothing about these ideas, so even if we accepted them, they would not help us decide who was right and who was wrong in such theological debates. So I think that Mathison has correctly diagnoses the problem, but he provided the wrong prescription. Or at least, it is an insufficient prescription. His solution might solve some of the extreme problems, and quiet some of the voices at the fringe who deny the Deity of Jesus, or the Trinity, but his solution will not help us with some of the other theological issues of our day. Also, I am suspicious that Mathison ultimately wants people to agree to the Calvinistic Creeds. He certainly drew the line from the Church Fathers, through Augustine, to Luther and Calvin pretty clearly. But Mathison is right that it is impossible (and unwise) to study the Bible all by itself, without reference to what others in the community of Christianity have learned and taught in our own day and throughout history. I think that Mathison has only uncovered a small part of the solution. Sure, we should study and receive guidance from those who have gone before us. But such teachings and creeds should not be the only guiding hermeneutical paradigm. Rather, I think we should also look at the actions of those who went before us. The teachings of those who exhibit the most love, care, grace, mercy, and forgiveness for others should carry more weight than those who exhibit anger, malice, judgment, hatred, and greed. The actions resulting from a person’s theology should help us decide which theology will hold the most weight in our consideration of their interpretation of Scripture. I couldn’t agree more with your statement of referring to the ACTIONS of those who came before us rather than their creeds or tradition. Jesus taught us from a position of authority, one very firmly rooted in his sinless nature and actions as a human being. He was clean before God. In contrast, the people of his day, the ones that were looked upon by the people as holy representatives of God, were actually Kabbalists and sacrificers of children. Their outer doctrine was based on traditions developed in deep sin, ones that rendered God’s law of no effect. Their inner doctrine was of Satan. These were the people to whom the oracles of God were given and they failed spectacularly. After Jesus left our world, are we to completely trust the judgement of people administering a State religion for a pagan nation? The same one that Changed the Sabbath day and renamed the days of the week to honor pagan gods? While I understand that there were good and faithful men and women among them, the lasting creeds and traditions are always subject to suspicion for me. I believe we spend far too much time nitpicking words, writing creeds and pointing fingers, and far too little time on our knees seeking the humility it takes to hear God’s voice. We don’t apply what we know to our view of what’s happening around us, we don’t seek his counsel constantly, and subsequently, we forsake the guidance of the Holy Spirit that guides us in natters of the spirit. The Ten Commandments are pretty clear. Let’s start with putting our whole effort into obeying them first and less trying to figure out whether or not guys a thousand years ago made them better. Just for the record, that’s not an attack. It sounded like I was coming at you after I read it. It’s just a general feeling I have about Christianity and academics in general. I understood where you were coming from, and did not read it as an attack. One thing I am sure of…that we can learn from the Christians of the past, just as much (if not more) than we can learn from Christians of today. Christianity is a community of Christ followers, and that means we all need each other, both to learn and to practice what we believe. So I try to study as many perspectives as I can, and then hopefully, arrive at the truth, which should be lived out in love. A couple of peripheral thoughts that popped into my mind when I was reading this. -Even those who claim to rely on “the Bible alone” are really relying on the way the Bible has been interpreted and understood within their tradition. For example,is infant baptism valid? Must one be immersed when being baptized or is sprinkling sufficient? Should anyone ever be “rebaptized”? If the Bible alone can provide the answer, then why does a panoply of answers emerge on these (and many other) questions among the various traditions? Great questions, and I agree with what you are saying. What I find quite amusing is that my Calvinist friends always start with Augustine but very rarely ever want to quote anything from those before him: the fathers of the first three centuries of the church. It seems to me they usually just ignore them. I believe one of the reasons is because several of the ‘core’ calvinistic beliefs were called out as heresy by the earliest church fathers. For instance, the idea of a strict determinism concerning salvation (the calvinistic interpretation of predestination & election). It’s not that this idea wasn’t known by the church… it was. But the issue is that it was only known OUTSIDE of the church for the first three centuries. It was a belief held by several of the gnostic groups, but not by the church. The same kind of thing is true for a limited atonement, unconditional grace, total depravity, inability to forfeit salvation, etc. – in other words, in every place where classical Calvinism departs from God’s Word. It is quite an interesting read in the early fathers though. The exact same arguments the gnostics put forth to explain their beliefs are the same teachings you hear today in calvinistic circles. It makes me sad that those things crept in to the church, but they did and we must deal with them from the standpoint of God’s Word. And in line with this blog post, tradition plays a part in that too simply in looking at the first three centuries of the church and understanding that they would be aghast at some of the beliefs that are claimed as ‘orthodoxy’ – both immediately following their time and from the 1500s onwards. Many trumpet their beliefs as, “…the truth once for all handed down to the saints”, but these Christians from the first centuries would be forced to ask, “which saints?”, because those things certainly didn’t come from them. These weren’t the truths which they defended in speech, ink, and for many of them – with their own blood. They were drug behind horses until they came apart, burned slowly at the stake, beheaded, flayed alive, grilled alive on sheets of metal, pressed to death slowly between weights – all of this because they proclaimed that Jesus was their Lord (Iesous Kurios and not Kaiser Kurios!) and the Apostles and the Spirit were the disseminators of God’s truth concerning His Son Jesus to mankind. And they, in their turn, sought to do the best they could to carry on the Apostle’s teachings that they heard from them directly or from the men that came directly after them. My opinion of them is that they would be just as appalled at Reformed Theology as they would Roman Catholicism. I believe they would see the former as corrupted with certain gnostic beliefs that slander God’s character and make Him out to be a liar, while the latter would be seen as so corrupted by paganism that it basically boils down to rude idolatry sprinkled with certain Christian beliefs. Certainly the fathers weren’t perfect. They were dealing with understanding God’s word through the Spirit just like us. The Greek fathers did have the benefit of being native speakers of Koine Greek and growing up in Koine speaking societies with all of their idioms and patterns of speech. I do wonder why more weight isn’t sometimes given to their understanding of Scripture (which was written in their native language) by those in our time and before who only learned Koine academically. It seems fairly arrogant to so diverge from three centuries of native language interpretation in favor of that which was learned in a classroom separated from the real use of language and culture by millennia. Personally, my biggest issue with the early fathers is that several of them took a turn towards works based salvation, or so it seems to me. Some of that can be cleared up by understanding that in their times there was a huge, cultural war between the concepts of vice and virtue (things were so bad that even some of the pagan philosophers were appalled), and they spoke to that from a Christian perspective that sometimes seemed to sanction works based salvation when instead they were simply drawing contrasts between how they behaved vs. the pagans. But other times it seems some of them truly did believe that they played a part in earning salvation, although in other places these same authors denied it. But then I have to examine my own heart and confess that when I look to myself and not to Christ, when willful sin begins to harden me because I have let it in, I too can begin to fall into legalistic, self justifying modes of thought and behavior. In this area, as in all areas of sin in regards to those who are indwelt by Christ, The Spirit always corrects me and snaps me out of myself, but can I look at these early Christians and claim that I am any better? Certainly not. I believe the best use of them is to acknowledge how poor their writings where when compared to Scripture. But I believe in God’s providence He has used that to show how truly special and unique the writings of the New Testament are – that they were inspired by Himself and not simply the writings of pious or pietistic men. The earliest fathers were often somewhat naive, somewhat childlike in some ways, but those qualities enabled them to hold on to the truth they had learned from the Apostles and apostolic men with a ferocity that I doubt would be much reflected in our day under similar persecutions. Although I disagree with much of what they wrote, the more I read them the more I love them. Most of them found themselves embedded in a sinful society that was so bad it makes our culture look like a self righteous meeting of the hair shirt, stick as a chair club. But in that most dire of times the Spirit worked through them to turn the world upside down for the kingdom of God. And at the end of the day, the vast majority of them would attribute their salvation to God’s grace rather than anything they had done to earn salvation. 7 Do not be deceived: God cannot be mocked. A man reaps what he sows. 8 The one who sows to please his sinful nature, from that nature will reap destruction; the one who sows to please the Spirit, from the Spirit will reap eternal life. 9 Let us not become weary in doing good, for at the proper time we will reap a harvest if we do not give up. 10 Therefore, as we have opportunity, let us do good to all people, especially to those who belong to the family of believers. 11 Here is a trustworthy saying: If we died with him, we will also live with him; 12 if we endure, we will also reign with him. If we disown him, he will also disown us; 13 if we are faithless, he will remain faithful, for he cannot disown himself. ( I hear so many Christians that take v 13 as a comforting promise, when in actuality it is a most solemn warning – God has made salvation available by His extension of Grace through faith that He enables in us by revealing Himself to us. Those that give up on faith are those that give up on the benefits of Grace, for being faithless is to consider God either unworthy of trust or unworthy of our endurance in the faith He has enabled for us. It requires a daily dying to self and daily suffering at the hands of our sinful nature against which we strive. Anything less than that is only a child playing with fire). 5 Moses was faithful as a servant in all God’s house, testifying to what would be said in the future. 6 But Christ is faithful as a son over God’s house. And we are his house, if we hold on to our courage and the hope of which we boast. 7 So, as the Holy Spirit says: “Today, if you hear his voice, 8 do not harden your hearts as you did in the rebellion, during the time of testing in the desert, 9 where your fathers tested and tried me and for forty years saw what I did. 10 That is why I was angry with that generation, and I said, ‘Their hearts are always going astray, and they have not known my ways.’ 11 So I declared on oath in my anger, ‘They shall never enter my rest.’ ” 12 See to it, brothers, that none of you has a sinful, unbelieving heart that turns away from the living God. 13 But encourage one another daily, as long as it is called Today, so that none of you may be hardened by sin’s deceitfulness. 14 We have come to share in Christ if we hold firmly till the end the confidence we had at first. 15 As has just been said: “Today, if you hear his voice, do not harden your hearts as you did in the rebellion.” 16 Who were they who heard and rebelled? Were they not all those Moses led out of Egypt? 17 And with whom was he angry for forty years? Was it not with those who sinned, whose bodies fell in the desert? 18 And to whom did God swear that they would never enter his rest if not to those who disobeyed ? 19 So we see that they were not able to enter, because of their unbelief. God bless ya’ll from Texas. Take care, /Scott. Great, great points, and I pretty much agree with you. Keep writing about things like this! Your contention that Calvinism arose from gnosticism or that Calvinism departs from Scripture is laughable!